Babysoy clothing for babies and toddlers is devastatingly cute, and smartly crafted from one of my favorite foods: soy. As a vegetarian, I have always appreciated soy as a source of protein, but I underestimated the possibilities inherent in soy, and I’m delighted to learn about its life as a fabric in the Babysoy clothing line. Not sure what gift to grab for the tiny eco-fashionista in your life whose wardrobe is brimming with clothing options? Gift her with Babysoy… her parents will be ‘soy’ happy you did. Babysoy’s darling clothing line is created with a combination of cotton and soybean protein fiber, which is made out of leftover soybean pulp from tofu and soymilk production. Soy contains 16 amino acids which are nourishing for our bodies both inside and out, making soy fabric ideal for baby’s delicate skin. Soybean protein fiber is a sustainable textile fiber made from renewable and biodegradable resources. All soybeans used to make Babysoy clothing are non-GMO (genetically modified organisms) and are not exposed to or treated with chemical pesticides. Soybean fiber is soft, light and smooth. In fact, it is smoother than cashmere. It also has better moisture transmission than cotton, which makes it more comfortable than the popular fabric; and it has excellent warmth retention that is comparable to wool. Babysoy is a socially aware company, and they employ local artisans who are fairly-treated and work in a safe environment. A portion of Babysoy’s proceeds are donated to Healthy Child Healthy World and Half the Sky. 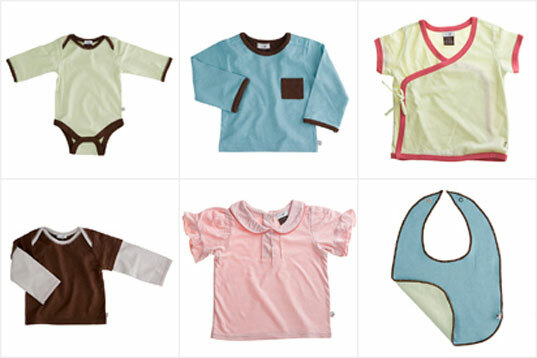 Sizes in the Babysoy line range from 0-24 months for infants, and 2T-4T for toddlers. Their cutey-cute collection of clothing for tots includes mittens, onesies, hats, pants, socks, and more. These threads boast a chic, modern design, and they are reasonably priced, ranging from $3.50–$32.00. Separate pieces in the collection are easy to mix and match. It’s hard not to fall in love with Babysoy. Their clothing keeps babies looking irresistible, your wallet fat, and the world green. 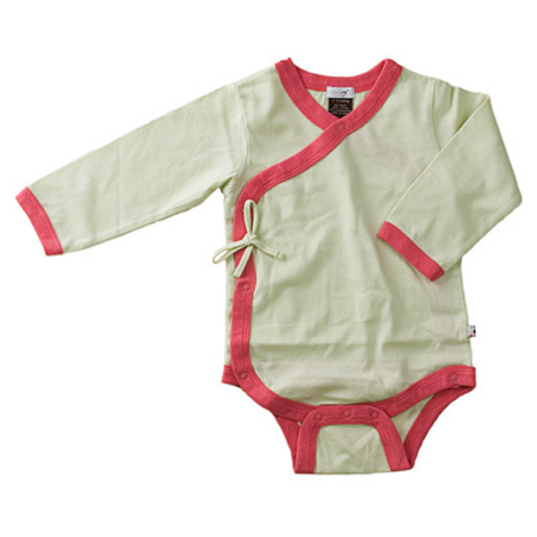 Check the tots off your gift list with clothing from Babysoy. Soy to the world! While I think it's great that alternative fabrics (as opposed to cotton and artificial sources) are getting more and more popular, soy is not at all a green fibre. You have to remember that it's a food plant and using it as a non-food item will only increase the problems that we already have with famine. This has become already evident in the struggle to develope alternative fuel (as opposed to oil as a source) as using corn or other crops as "eco"petrol has proven not to be a greener alternative. Also, to keep up with the rising demand for soy, corn etc. rainforest is burned down, swamps laid dry and the area of monoculture farmland is increased. This will most probably lead to a further loss of biodiversity (just think of the orang-utan in the Sumatran rainforest) and will also decrease the amount of CO2 absorbing forest area. I really hate to have to spoil the happy feeling people might have reading about soy colthing, but hemp, organic cotton and bamboo are so far probably still the most green alternatives. Let's not do the mistake to be shortsighted and fund further destruction of our planet by getting excited about things before doing some research and making sure that certain objects are really as green as they claim to be. Babysoy clothing for babies and toddlers is devastatingly cute, and smartly crafted from one of my favorite foods: soy. As a vegetarian, I have always appreciated soy as a source of protein, but I underestimated the possibilities inherent in soy, and I'm delighted to learn about its life as a fabric in the Babysoy clothing line. Not sure what gift to grab for the tiny eco-fashionista in your life whose wardrobe is brimming with clothing options? Gift her with Babysoy... her parents will be 'soy' happy you did.